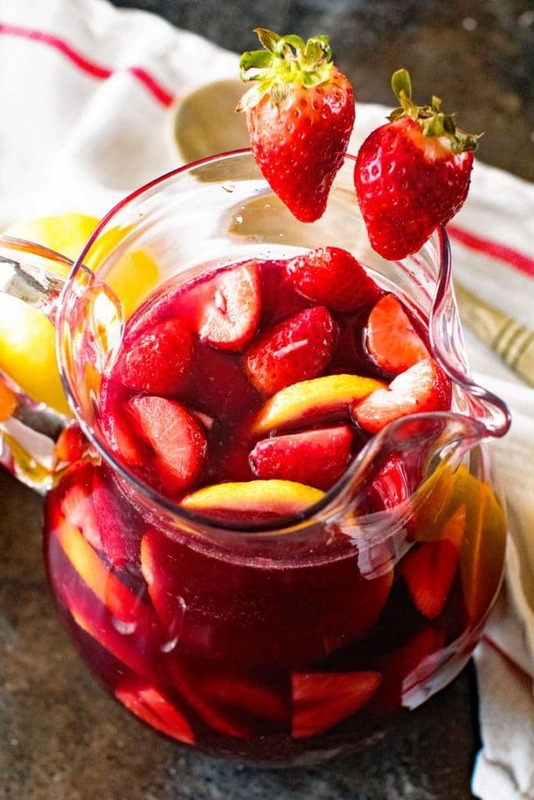 You will be sipping this Easy Sangria Recipe all summer long! It’s perfectly sweet, fruity and delightful on a hot summer day. 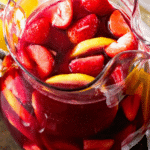 Celebrate summer by inviting friends over and enjoying a pitcher of Red Sangria! 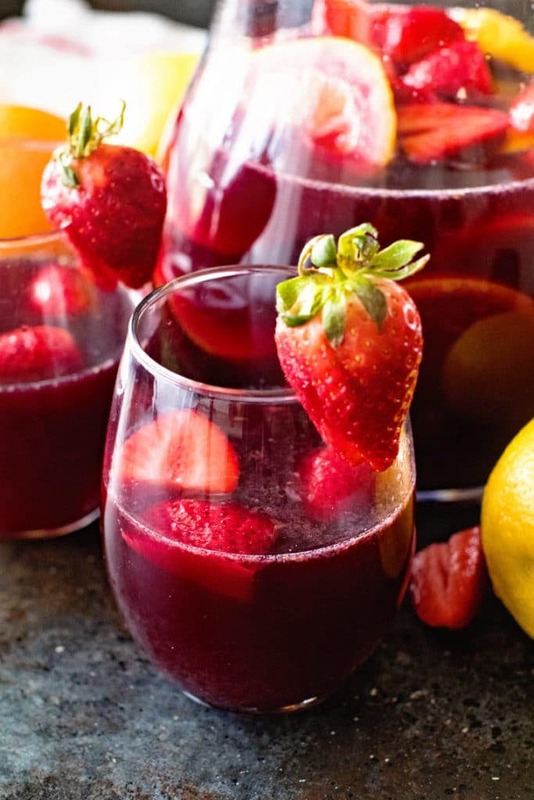 This perfectly sweet and delicious Easy Sangria recipe is loaded with lemons and strawberries. It’s perfect for a hot summer day! Invite all your friends over and whip up this sangria before they come so you can enjoy it with them! Sangria is kind of my jam. It seems that it’s your guy’s jam too. You adore this Peach Rose Sangria, Strawberry Limeade Sangria and Blueberry Sangria! I’ll admit I’m not real picky when it comes to my sangrias but the first one I ever tried was that Blueberry Sangria and it holds a specially spot in my heart. But, this Easy Red Sangria might knock it out of it’s #1 spot! This Easy Sangria is seriously the best of all worlds. Slightly sweet, loaded with fruit and refreshing on a long hot summer day! I love that Sangria is so flexible in it’s ingredients. Don’t let it intimidate you! I mean, really, can you go wrong with fruit soaked in alcohol? I think not! On the short Sangria is made up of red wine, citrus, sugar, fruit and some kind of hard liquor. The hard liquor is typically brandy, rum, or vodka. For the fruit aspect this is also flexible. 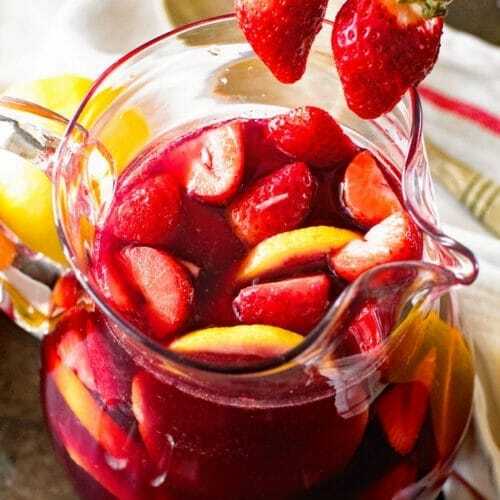 Anything from lemons, strawberries, oranges, pineapple, pears and peaches can be thrown into Sangria depending on what you have in your fridge! I usually finish my Sangria off with a little bit of lemon lime soda, but this is totally optional and not required. What do you typically put in your sangria? How Do I Make Sangria? First in a large pitcher add wine, brandy, orange juice, triple sec and sugar; stir until combined and sugar is dissolved. After that add lemons and chopped strawberries, stir. Put in fridge for at least 4 hours up to overnight! Then add your lemon lime soda before serving. This is optional… it’s great without it too! What Kind of Alcohol is in Sangria? Essentially it’s a fruity wine with a kick, typically a hard alcohol added to wine and fruit. A lot of time there is a fruity flavored alcohol that is also added. This Easy Sangria is a red sangria so typically a Merlot is used. It doesn’t have to be an expensive one because you don’t want the flavors in your wine to overpower everything else in the sangria. Otherwise you could use a Shiraz too. Typically a hard alcohol is added. I used brandy in this Red Sangria recipe for that component. Sometimes a rum, gin or vodka is used. I also used Triple Sec which is a liquor with an orange flavor! Check out this step by step video below on How to Make this Sangria Recipe! 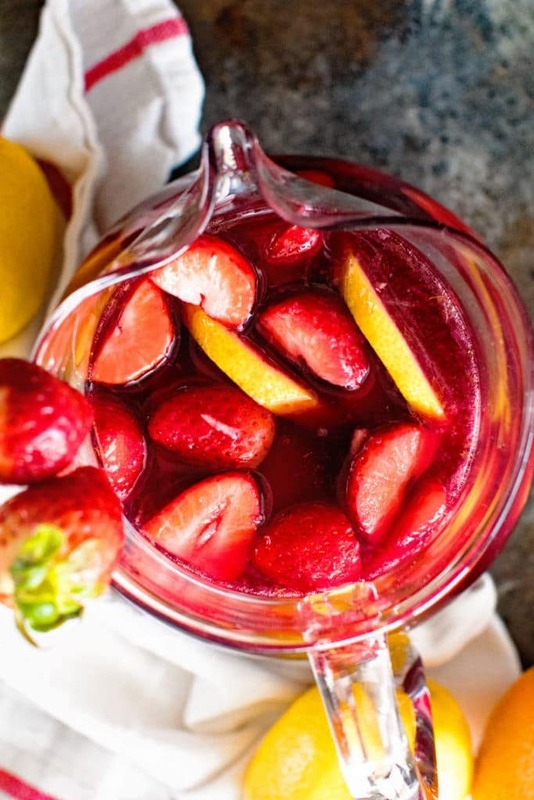 You will be sipping this Easy Sangria Recipe all summer long! It's perfectly sweet, fruity and delightful on a hot summer day. 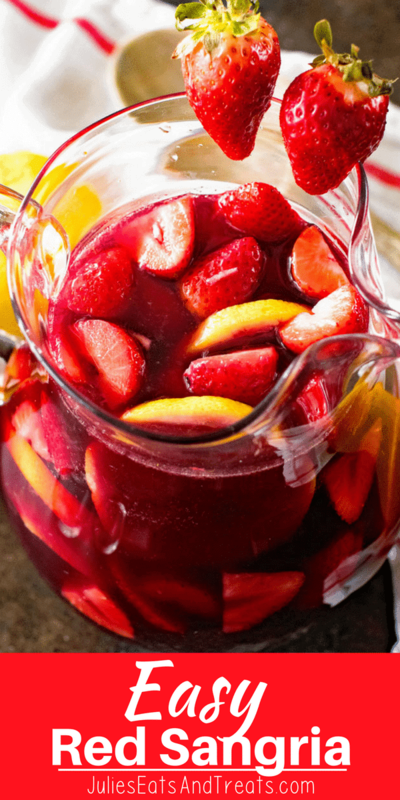 Celebrate summer by inviting friends over and enjoying a pitcher of Red Sangria! In a large pitcher add wine, brandy, orange juice, triple sec and sugar; stir until combined and sugar is dissolved. Add lemons and chopped strawberries, stir. Put in fridge for at least 4 hours up to overnight. Add lemon lime soda before serving. You can use any type of fruit you'd like to in this sangria. For example strawberries, oranges, lemons, pears, lime, pineapple etc. I used a Merlot but anything goes as long as it's a red wine! This is such a refreshing drink and so full of fruit – love it! Hands down sangria is one of my favorite drinks!! I love all the fruit! I don’t drink alcohol, but this looks amazing! I’m wondering if there is a way to make this non-alcoholic, because it looks so good! I’ve seen them made with apple and orange juice + carbonated water before!